BOSTON - A barefoot man screaming "Boston Strong!" was taken into custody Tuesday night after two unattended backpacks were found at the Boston Marathon finish line on the anniversary of the bombings, police said. The area near the finish line was evacuated after the backpacks were spotted there, CBS Boston reported. Boston police confirmed that a male suspect had been taken into custody. At least one of the bags was being carried by a barefoot man who was wearing a long black veil and screaming, "Boston Strong!" A law source confirmed to CBS News that man taken into custody was 25-year-old Kayvon Edson. Boston police spokesman Dave Estrada confirmed the suspect's last name was Edson but did not have his first name. Estrada told The Associated Press that the backpacks were discovered at about 6:50 p.m. The police department asked people to stay away from the area and said a bomb squad was at the scene. "Bomb Squad still on scene in the area of Marathon Finish Line investigating call for 2 unattended backpacks," the police department tweeted. 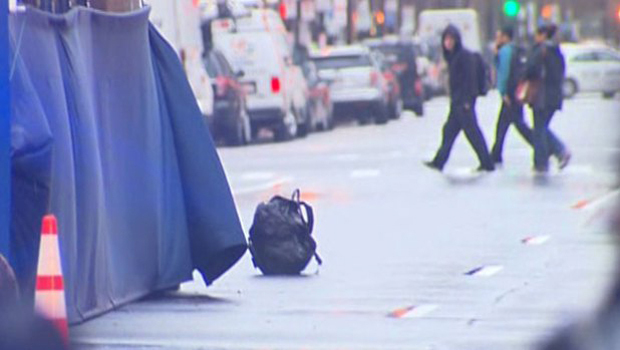 The bomb squad detonated the backpack on Boylston Street just before 9 p.m. The second bag was detonated about 40 minutes later. Police did not say what was in the bags. But a source told CBS Boston that when Edson was stopped by police, he told them he had a rice cooker in his bag. The rice cooker was full of confetti, the source said. Edson also had camera equipment in his bag. The source told CBS News that Edson suffered emotional problems, but the nature of those problems remained unclear. The two bombs that exploded near the finish line of the Boston Marathon a year ago, killing three people and injuring more than 260, were left in backpacks. Both were made from pressure cookers. Earlier Tuesday, Vice President Joe Biden joined survivors and victims' families for a moment of silence at 2:49 p.m., the time the bombs exploded. Edson is charged with disorderly conduct, disturbing the peace and possession of a hoax device, CBS Boston said.He was expected to be arraigned Wednesday.